Set of three figurines. WG or GW Below crown/coronet? Set of three figurines. WG or GW Below crown/coronet? 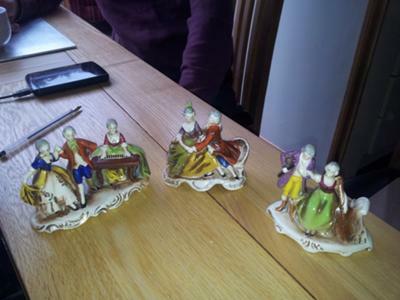 :- This set of three figurines, representing a musical evening of some sort, has sat on my mothers dressing table for as long as I can remember. She was married in 1941 and my understanding is that they were a wedding gift to her. 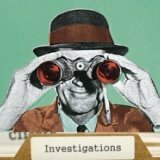 My mother died in 1964 and more recently my father died and I have no information about their origin. One figurine consists of a man and lady dancing with another woman sat at a keyboard. The second one is a courting couple sat on a chaise longue. The third consists of a lady holding a cello and interlocking her other arm with a gentleman standing alongside her. All three are on white bases with a gold swirling gilt detail. GM followed by 582, another is 584 and the third has 586. They also have a blue/green painted logo of a basic crown over the letters GW or CW. Unfortunately I do not have any other information to assist in the identification of these figurines. As you can see from the photographs, the style of clothing seems to depict the time of Mozart and they all appear to be wearing wigs. I would appreciate any further information anybody may have on these objects of sentimental value. To: Set of three figurines. WG or GW Below crown/coronet? You have some early 20th century figural groups from a very famous German maker - Goebel, who went on to launch the Hummel children collection in 1935. These figures (like the Hummel figures themselves) vary in value depending on their 'desirability' to collectors. Sadly, these lady and gent figures don't appear to me to that highly sought after at the moment, when I checked at past auctions. But don't quote me, I am not a valuation expert. Here is a chart to help date Goebel marks. The Crown Marks (Trademark 1 or TMK-1) used 1923 - 1949 "WG" stands for William Goebel. This mark was used on the famous Hummel figures from their launch in 1935. The same mark had already been used for 12 years before the launch of the Hummel collection. Some online references incorrectly date this mark from 1935 which is incorrect. Before 1923 was was a similar crown, but not so wide. The TMK-2 mark (or full bee mark) used from 1950 to 1955. The 'trademark 2' device morphed the crown into a bee. 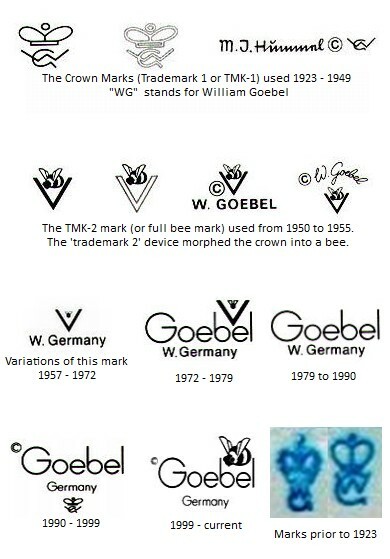 The images show the progression of the Goebel mark from 1955 - 1972, to 1979, to 1990, to 1999, to current. 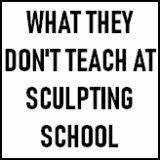 Interesting figurines from a highly collected company. Comments for Set of three figurines. WG or GW Below crown/coronet? Hello, I recently acquired a figurine that I'm trying to find out more about but have not seen any figures like this one online as of yet. The markings are TM 1 Hummel, Double Crown with the impression of number 35 along with some other impressions. I believe it's a rare one of the first by Hummel, but not 100% sure as of yet. 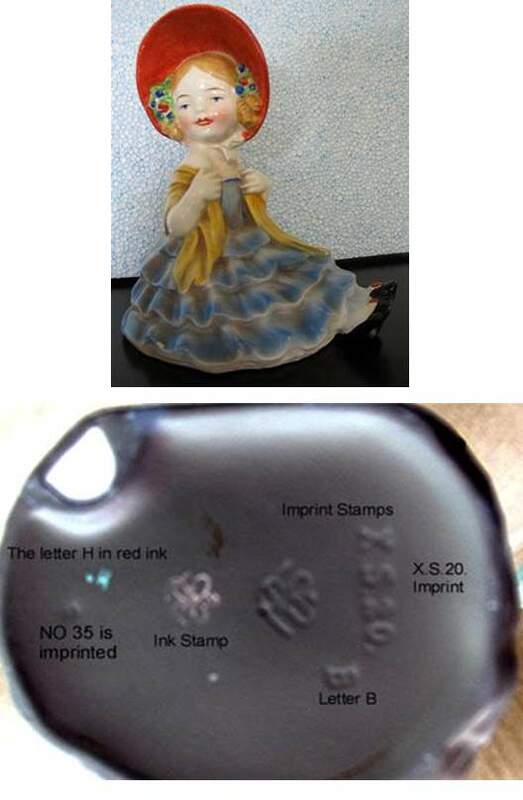 Here are 2 photos, one of the figurine and one of the closeup of the markings. I had to dabble with color enhancement to bring out the markings because my camera cannot pick up that close for whatever silly reason. If anyone can help me please email me I'd appreciate it tons! The mark appears to be Goebel but not necessarily Hummel, see above markings timeline. Goebel were in business for many decades before partnering up with Sister Hummel. I have the girl (X 920B) but not the boy. Mine has a purple hat. One would have to be careful matching these up as the colours won't necessarily be right. This is definitely not a Hummel -it is a Goebel with a Goebel trademark (wide incised crown 1923-1949). if anyone has a boy figure to match I would be interested. The problem is that they would not have worked that well as bookends as they are so light. I suspect, therefore, that there are not that many complete pairs around as the tendency would be for the books to push these off the end of the shelves and thereby breaking one of the pair. The older Goebel pieces prior to the Hummel ranges are different in certain finishing details. The glaze on the figurine is very shiny. Hummels were flat finish typically, and has more yellow in the paint pigments. Hummel mold numbers don't begin with an alpha letter, it might end with one, such as 141X. The Hummel crown marks have the appearance of Goebel's stamp but are distinguished by the famous stylized WG. If the figure is a Hummel original, then her signature should be on the base. I am not an appraiser or antique expert, just an inheritor of a collection of 31 Hummels who has been spending a great deal of time looking for information on each piece. it also has a flat back with the same details as yours. I have been collecting figurines that look very similar to these ones since I was a teenager. I have been trying to figure out more info about them for quite some time now with no luck. They look very much like these, but instead of Germany these say "Japan" or "Occupied Japan" on the base. Some of the ones I have are lamps. I have noticed differences in the glossiness of the paint as well. The ones that say "Occupied Japan" have similar finish to the ones shown above, whereas the ones that say "Japan" have more of a flat finish. If anyone can provide any info about these, I would be very appreciative. I received the first one when my grandmother passed away several years ago, and I can't seem to find any info on these anywhere. Thanks. After WW II Japan copied many of the popular Hummel figurines that American soldiers were bringing home from Germany. The only ones that have any value are those marked "Made In occupied Japan". Why? Because there's still a large contingent of people who collect "occupied" items. I'm sure everyone else has seen the value of their beloved Hummel figurines drop over the past twenty years. There's two reasons for that - 1. Many original collectors have died and left their items on the market. As a result, the markets been flooded with too many, and as they say when supply goes up, prices go down. 2. EBay. A quick way to make money has also flooded the market with Hummel items. All collectibles have suffered. 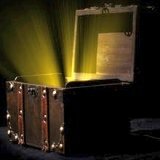 Only those with intrinsic value have kept their prices up. Only those truly rare, and I mean more or less unique have value. Many people who paid good money for their "limited editions" found out they were well, basically scammed by the Seller's of such objects. Others just didn't realize just how many plates could be mass produced in a limited "firing run" of ten days. Ones who thought that might mean a few hundred realized it meant hundreds of thousands! They gladly paid $50 a plate and then left their valuable collections sit until they downsized after retirement. That's when they tried to sell their nest eggs, only to be found with egg on their face when told their $50 plates were now going for $4.95 or less. The key to collecting, as my Grandmother told me back in the 1960s, is collect what you like, collect what you enjoy. If by chance you make money on it, then that's good. If you don't, well you enjoyed that item all these years; so that's worth quite a lot right there. I have a courting couple figure from Germany, possibly 1920 s or earlier with a crown and WG with the number 34. It is not shiny porcelain but matt unless by age it has become that way. It is completely white although it looks like the eyes did hold some colour. I have no idea about this figurine. Anyone help me please? Looking forward to feedback. I bought a figure of a little boy in an apron wiping a dish with a black pup. It has written beneath "Mother's Helper" 1110 in cursive with no other discernable markings. Any help identifying this would be appreciated. Hi, I have several figurines. Two of them has the W G mark but with a brown-golden crown which is not like the marks in the image above. The figurines are all white with kids playing with animals.Are these figurines made by William Goebel? How can i know its value?